Cancer: Taking Control of My Garbage. 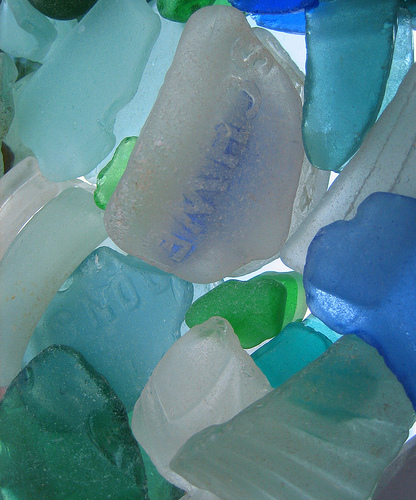 I used to have a collection of sea glass. 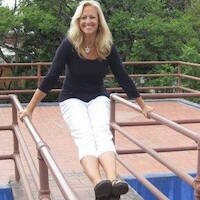 I gave it away when my husband Dave and I decided to live as nomads and got rid of almost everything we owned. So, what was the point of collecting more? Collections do not jive with nomadic ways. An amber piece winked at me from the sand. I bent down to pick it up. I love the idea of garbage transformed to gems. Her face lit up as though I’d offered her a yellow diamond. So for several weeks, I picked up pieces of seaglass and gave them to the collectors. What a wonderful feeling—giving random gifts to strangers. One day on the beach, Dave and I focused on sending out beams of love and healing energy to a good friend who at that moment was undergoing cancer surgery. Last August, I had successful brain surgery and I wished the same phenomenal healing for her. The day before, I sent her an email with a list of what I had focused on during my medical experience. She printed it out to take with her to the hospital. I know tomorrow is the day you are pushing the reset button to get rid of the old and bring on the new, totally healthy you. May you see the bright white light of all your health practitioners. May you appreciate their expertise and everything that brought them into your sphere. May you appreciate all the conventional and alternative resources that have come together in your life. May you see the truth of yourself healed and whole. May you feel the powerful stillness of your spirit, which is fully connected to all that is. May you feel the love of everyone who surrounds you and thinks of you. May you know that all is well. I thought about these things as we walked down the beach. We came across a stretch of sand peppered with a mass of sea glass. Dave bent down to pick up a blue piece, a green one. I picked up a white one, a red one shaped like a tiny heart. We held out our palms. We ooohed and ahhed. We gathered piece after piece. We dropped them into a plastic bag and kept going. I wondered for a moment if we were going to keep these. Could we help ourselves? And then I realized we were doing it for our friend. We would find the perfect vessel for the gems. We would tell her about the gifts washed up from the sea, just for her.